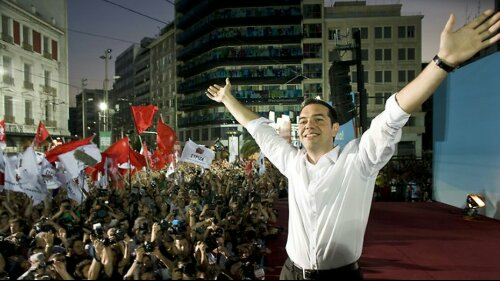 ‘SOCIALIST GREECE’ -two words many thought they would never hear, but it happened last night. After 6 years of austerity driven by banking bailouts, the people have voted for change and an end to debt slavery. 6 years of protests, riots and rallies lead to this, change. At least on paper. Syriza might well represent the chink in the ideological austerity armour people have been waiting for, it might also well be a false dawn. Only time will tell. Short of 2 seats for a full majority, Syriza has entered into a coalition government with an anti-austerity, far right group to secure their plan for a change of economic path. How an alliance with a far-right group and a socialist party goes will be interesting in itself. Let us hope for the Greeks sake that Tsipras and Syriza are more socialist than Nick Clegg and the LibDems! Syriza will be under incredible pressure to pursue reformist policies over their more aggressive stance in the lead up to the election on Greece’s fiscal situation. The Germans have already warned Syriza that they have finanicial obligations (€240bn bailout package and the Europe Central Bank also committed to dumping extra cash into the eurozone in the days preceeding the election as markets fluctuated over fears a Syriza victory would lead to ‘The Grexit’. The hypocrisy of European leaders amd the Financial Times falling over themselves to tell Greece what they can and can’t do, when they themselves are flat broke is laughable. The mood within Syriza had softened leading up to the snap election, as they went from an outside bet to a perceived threat in 3 years, with Tsipras toning down the rhetoric of “tearing up the economic package” that has crippled Greece, to one of measured negotiation and refinance. What they should do is take a lead from Iceland who jailed bankers and bailed out their people, not the banks. The people of Greece have suffered significant increases in homelessness, poverty and unemployment – all on an unimaginable scale, they deserve better. Syriza might stem the flow but will they turn back the tide of austerity if the weight of corporatocracy comes down on them? As one woman put it when she said she had “nothing left to lose” by voting for them, they became charged with resurrecting the dreams of not only a nation but an entire movement throughout Europe. I have seen people who have never voted before committing publicly that they will vote for the Green Party in the UK in May, on the back of the election result in Greece last night, such is the power of the feeling of hope. The people have voted in Greece because they want to show Europe and the money lenders that they have had enough of austerity and slavery, Europe must hear this and act accordingly to save people and not keep saving banks. I just hope Syriza are daring enough to have the courage to not be the party the people need right now, but the one that people really deserve.